This weeks Craft Feature comes from Santa Cruz, California! 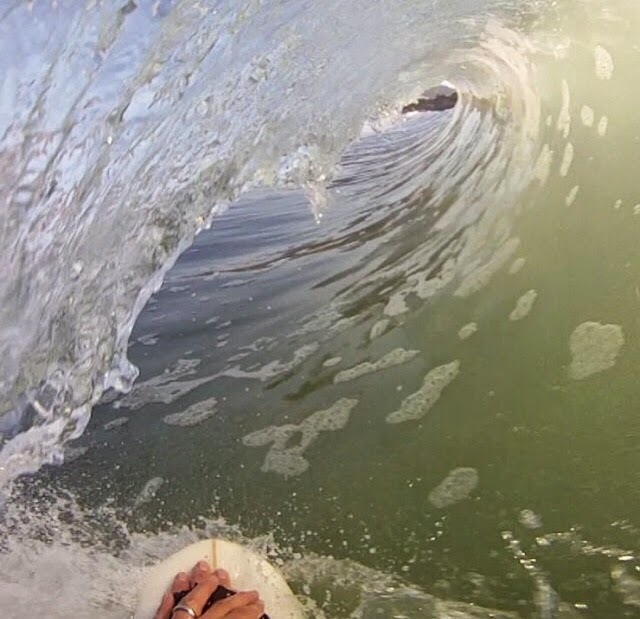 Jason, a Purist at heart, has been surfing and bodysurfing since the 80's! He's the one man operation behind an EcoFriendly, Purpose shaped, Innovating company. So feed that hunger for getting pitted with the awesome story of Superbiscuit!!! DSDF: Tell me a little bit about yourself? Where you are from and what company/organization are you with? My name is Jason Hackforth, and I'm the creator of the Superbiscuit. I've lived in Santa Cruz since 1979, and have been making handplanes since 1996. I take broken or otherwise unusable surfboards, cut them up and shape them into handplanes. I do all the glassing myself, and also hand make the straps and strap plugs. I'm a one person operation at this point. I specifically make handplanes designed to deliver high performance in really hollow waves. Any flat bottomed handplane will work in little almond shaped barrels, mine are built for holding a high line in square, hollow barrels and not sliding out. The techniques I use are the result of almost 20 years of testing what works in these conditions, and (more importantly) what doesn't. DSDF: What Surf Craft(s) do you make/offer? I really only just make handplanes, that's my specialty. Currently I offer three models- the standard Superbiscuit, a slightly larger plane that I've decided to call the Ultrabiscuit (I'm still considering whether I like that name or not...) and my new experimental model, the Picklefork. The Picklefork works so well though that I'm making it a production model. It's really the best handplane that I make. DSDF: When and How did you get into Surfing? I've been surfing since around 1986, and started bodysurfing around 1989. Originally it was just about something to do at the beach to avoid boredom and cool off, if we didn't bring our boards or it was too small... but once we started getting barreled it became an addiction. My friends and I started gravitating to other beaches in town, looking for better barrels and more sophisticated and powerful setups. Santa Cruz has a lot to offer in that department. I remember meeting a friend at a place north of town around 1995, a cold and slabby beachbreak. He had a weird handplane; it looked like a rainbow flipflop and had blue 1/2" straps for the thumb, index finger and two middle fingers. I scoffed (I was a purist at the time), but still was curious to try it. I was absolutely blown away at the difference in lift and speed that it provided, I was able to do turns and moves that I never would have been able to with just my hand alone. I was immediately hooked. Shortly after that (this would be early 1996, in the winter), I found a broken surfboard in a garbage can at 26th Ave and took it home. I stripped it, trimmed it down and created my first handplane- which I now call the Protobiscuit. I had no glassing skills, I was soaking strips of fiberglass in resin and glassing it papier mache style. Nor did I have any idea how to attach a strap, I just took some velcro and laid fiberglass strips right over it. It looked terrible, but it worked. It took me a while to figure out a better way to attach the straps. I was suiting up for a session at It's Beach around 1997 and I saw a wind surfboard, and took a close look at how its straps were attached. That was the inspiration I needed to figure out the Strap Dilemma, and shortly after that, I began making my own straps and strap plugs. Once I had made a few good ones, people started asking me- "What the hell is that?". In the late 90's, the word 'handplane' only applied to a woodworking tool, there wasn't really a good term to describe this kind of bodysurfing device. I had a lot of people say to me- "oh, that's a cool little hand gun", but I wasn't really a fan of that term as it applied to what I was doing. I just started calling them Biscuits for lack of a better word. The 11th handplane I made was an experimental model, and it performed immensely better that any handplane I had ever made before. I nicknamed it the "Super Biscuit". 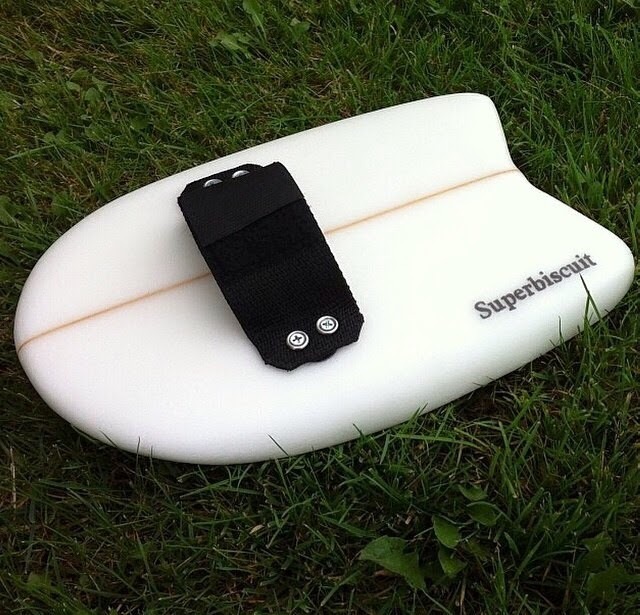 In 2012, my brother convinced me that I should start marketing and selling my handplanes, and I decided that Superbiscuit should be my brand name. 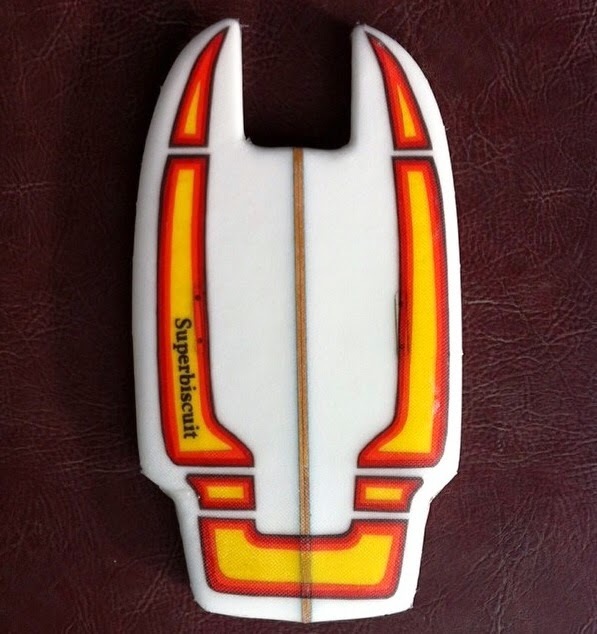 DSDF: What is your favorite form of Stoke (SurfCraft)? Why? I'm a fan of all surf craft, but I really only participate in a few. I've never ridden a paipo, or an alaia or a kneeboard, or a SUP. Mostly just because I've never had access to any of those. I came up riding shortboards; my current shortboard is a 6'6" M-10, and I have a Taylor 6'10" that I learned to surf on in the 80's. To be honest, I mostly just bodysurf these days. Santa Cruz is just too crowded, I have so much more fun and get much better quality waves bodysurfing. I just want to get barreled, that's the most important thing for me. DSDF: Any specials projects or events you'd like to share or start? I wouldn't mind seeing something like a Handplane Hoedown happen in NorCal, I don't know if the bodysurfing scene up here is robust enough for something like that to actually happen, though. DSDF: Where do you see the Culture heading in the near Future? I'm noticing more and more people out bodysurfing with handplanes, which I think is good. There for a while it seemed like I was the only one... I don't know if it's just a trend, or if people are really discovering that bodysurfing is just more fun, but I'm happy to see it either way. One other thing I'd like to add- I've noticed a tendency in the PU foam handplane community to create planes without stringers. I personally think that stringers are extremely important; in my experience, without a stringer the holes drilled to accommodate strap plugs will create a 'weak point' where a handplane will crease or break if put under pressure. I understand that you can get more handplanes per board if you don't include a stringer, but I've also heard from several people that they've had their handplanes break in precisely that spot without a stringer. I'd strongly advise anyone who is serious about purchasing a handplane to consider this. Any shout outs, Thank you's, or comments? I'd like to say thank you to my brother, Issac Bonaker for inspiring me to move forward with this thing and to my wife and daughter for putting up with me and my tendency to disappear for long periods of time into my garage (AKA the Biscuit Lab). I'd like to thank John Mel of Freeline Surf Shop, Braddah Timmy Hunt of Pono Hawaiian Grill and Lyndsey Cook of The Phat Shack in Hong Kong for being early supporters. A shout out to Masakazu 'Mabo' Shichiri of Mabo Handplanes in Japan as well; he and I are doing very similar things on opposite ends of the planet, and we frequently bounce ideas and techniques off of each other. Also I'd like to extend a shoutout to Hotline Wetsuits of Santa Cruz; I've used these wetsuits for many, many years and I believe there are none finer. Hand made, locally produced, long lasting and comfortable- it's the only wetsuit I will buy. And, of course- thank you to everyone who has ordered a Superbiscuit! Thank You Jason for Supporting Different Stoke!!! When we get a chance to meet up sometime, I'll be sure to bring my Paipos, so you can ride!!! Aloha! My name is Mondo, some of you know me as DuppyKonkarar on Instagram. I'm an enthusiast of all surf craft...from Hand planes, bodyboards, bellyboards, longboards, funboards...and my favorite, The Paipo! I've always been attracted to the odd and misunderstood! The underdog? When most focus on the ONE thing about a Culture or Lifestyle, I look around. I try my hardest to find all that is part of said Culture. Within this modest blog, I hope to share my Love for all things Surf...and I'm looking forward to learning even more from all of you!!! So please, feel free to share whatever it is you know about the Pursuit of Stoke!!! Here we Go!! !